Born an Army brat to Colonel Jacob Kane and Captain Gabi Kane, Kate and her twin sister Elizabeth grew up moving from base to base. In Brussels, while her parents were working for NATO, Gabi and the girls were kidnapped by terrorists from the Religion of Crime. Kate was rescued by her father, but not before her mother and sister were executed before her eyes. Kate enlisted and was accepted at West Point. During her time as a cadet, Kate was involved in a relationship with her roommate. When asked by her commander to confirm the rumors, Kate admitted her sexual orientation but did not reveal her partner. Under DADT, she was dishonorably discharged from the Marines. Her father felt it was more important to be honest with herself rather than lie. Jacob Kane married weapons heiress Catherine Hamilton, establishing Kate as a Gotham Socialite. She quickly achieved notoriety for her drinking and partying. Pulled over during a routine traffic stop after a party by a female officer, Kate didn't end up with a drunk driving citation. Instead, she struck up a relationship with the officer that lasted for some time. Kate and her police officer girlfriend eventually broke up after Kate heard one time too many that she had no goals, no direction, and no means to get there. Shortly afterward, Kate escapes from a mugger by complete accident. Catching a stray shadow from a street lamp, the mugger mistook it for Batman and fled the scene screaming the caped legend's name. It was a turning point in Kate's life. Her father tried to talk her out of becoming a vigilante at first, but he was at least successful in convincing her that she needed more training. With Jacob's help, Kate travelled the world for two years and trained with the best military and spec ops experts that would teach her. She learned how to fight the physical battles, but more than just that. She also developed the tools and skills and the discipline to wage her war on crime. And while Kate was training, Jacob used his connections to come up with experimental weaponry and gear for her as well. Taking up the emblem of the Bat for herself, Kate works in Gotham acting as his agent. She focuses on violent crime and has come to specialize in the very unusual cases. The ones that are too obtuse or esoteric for the GCPD to get any traction. Much like Bruce Wayne, she juggles her social and personal life with her vigilante night-life. Initially trained at West Point, Kate received additional training from some of the best military operations minds in the world. She sees herself as a soldier fighting crime, and calls those such as her father and Batman 'sir'. Kate is a full-fledged lesbian, seeking the romantic company of other women exclusively over men. She doesn't hate men, she just doesn't date them. Kate, her mother and her twin sister were kidnapped by terrorists from the Religion of Crime when she was young. Watching her mother and sister executed traumatized young Kate. She learned to push past it in time, but nothing touches a spark of anger in her faster than endangered innocents. In her civilian role, Kate works to keep up the hard-earned reputation of a party-girl socialite. It's a good distraction from her costumed identity. As Batwoman, Kate's military training shines through. She is no-nonsense, efficient, and mission-oriented. 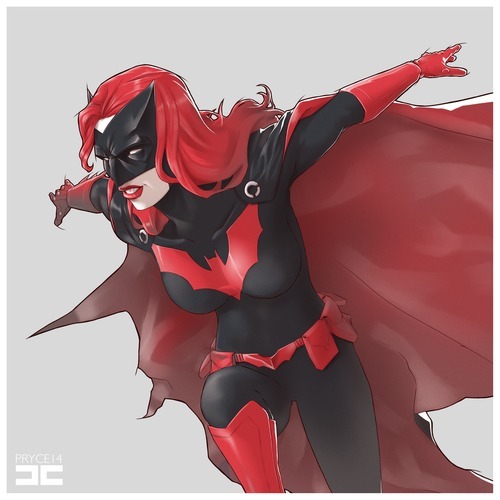 Kate's goals go back to her days as a soldier and she applies military doctrine to her tour of duty as Batwoman. She must be ready at all times to protect the innocent, to fight the enemy on foreign soil or domestic, to carry the battle to him and to win by any means necessary. In her case the term 'enemy' applies to anyone on the wrong side of the law. She is a soldier and this is her war. While Kate sees all criminals as the enemy in her personal war on crime, she is especially motivated to protect the innocent. She lost her mother and her sister to violent crime, and she will do her damnedest to make sure that no other child has to go through that the way she did. It's also why she's a bit rougher on violent criminals than, say, burglars or car thieves. Kate is a normal human without any Powers. Kate's father has connections throughout the weapons industry. He keeps her gear current, and monitors her vital signs whenever she's in costume. In addition to tech support, the Colonel runs intelligence checks from Kate's HQ so that she can maximize her time in the field. Kate's stepmother is an heiress, which means Kate is one of Gotham's richest socialites. The Kane family is said to own the half of Gotham that the Waynes do not. She wants for nothing that money can buy. Kate has an arsenal of lethal and non-lethal weapons, in addition to her protective suit. On her utility belt are tear gas grenades, lock picks, gas mask, thermite grenades, collapsible batons, collapsible batarangs, grapple gun, and a gas gun. She also carries a smart phone that she uses for computer hacking as well as communication. The cape and body armor suit are made of carbon nanotube composite, making them mostly impervious to small arms fire, including automatic weapons. 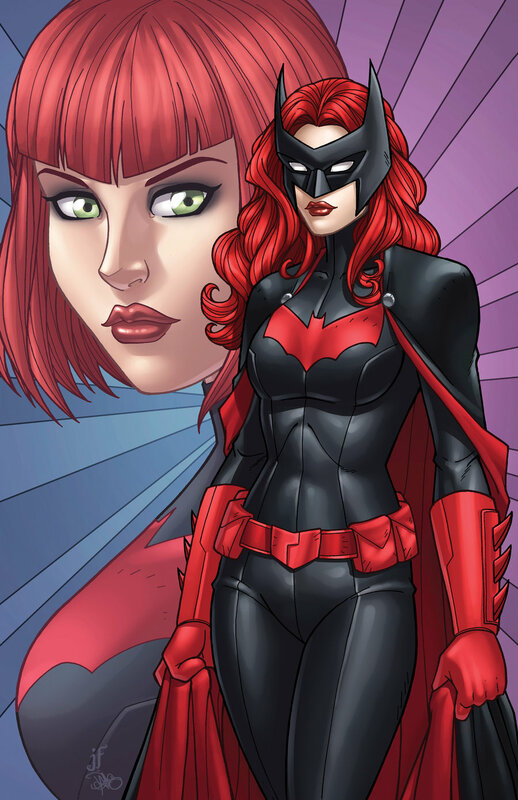 The cowl is padded to protect from blunt-force trauma, and has a red wig inside to further conceal her identity. It also includes starlight lenses for improved night vision. GPS tracker, bio-monitors and a radio receiver provide real-time data to the Colonel. As Batwoman, Kate rides a souped-up Bat-cycle in her colors to get where she's going in a hurry. The souped-up Ducati is hardened so that it still runs well even after Kate ditches at high speed. 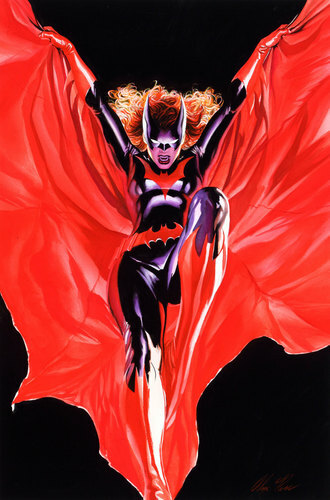 As Batwoman, Kate operates out of a secret headquarters whose location is known only to her and the Colonel. It's where she trains, maintains her gear, and stores her consumables (i.e. - spare grenades). Kate is very proficient in armed and unarmed combat thanks to her training. Initially trained at West Point, she received special operative training with the British Special Air service, Navy SEALS, and Army Rangers among others. While she's not a martial arts master, she is an incredibly capable combatant. Thanks to her lifestyle and training, Kate has an incredibly high tolerance for pain. It's common for her to continue fighting even after being wounded. Kate trained in gymnastics from a young age, and was a Senior Elite Gymnast at West Point. She is quite comfortable carrying on a fight while jumping between moving vehicles or in free-fall. While she's no circus acrobat, Kate is very much in her element. Thanks to military psychology training, Kate is a very effective interrogator. Her technique mostly relies on being very intimidating as well as being willing to hit people hard, combined with sudden softening. For all her brusqueness, however, Kate does not believe in torture or maiming. Kate knows some basic programming as well as computer hacking, and she is very careful to keep her own system uncompromised. Kate has a thorough knowledge of human anatomy, including pressure points and natural weak spots. She is skilled enough to provide medical care for herself or someone else beyond simple first aid. Being raised as an Army brat, Kate trained at West Point as well as with special operatives. As such she is thoroughly acquainted with military protocols, procedures, and doctrine. With the ultimate goal of fighting crime, Kate has studied all the standard investigative methods. She knows how to conduct a criminal investigation beginning with a crime scene. Kate also knows the protocols for a legal investigation. She is well-versed in forensics and capable of making reasonable determinations of cause of death and the like. A part of all special operations training includes knowing how to make lethal cocktails out of common, household chemicals. Whether it's poison, corrosive agents, or explosives, chances are Kate knows a recipe you can get filled down at the corner grocery. Kate was trained by some of the best Spec Ops people on the planet, and developed a natural affinity for sneaking. She is a master of stealth, being able to avoid detection by superhuman senses. Kate is very aware that maintaining a separation between Batwoman and Kate Kane is absolutely essential to keeping her family safe. The Kane fortune isn't so vast that they're not vulnerable. Kate has a couple of very distinctive tattoos. One is a large Nautical Star on her upper back. The other is a Green Beret sleeve insignia on her right upper arm. 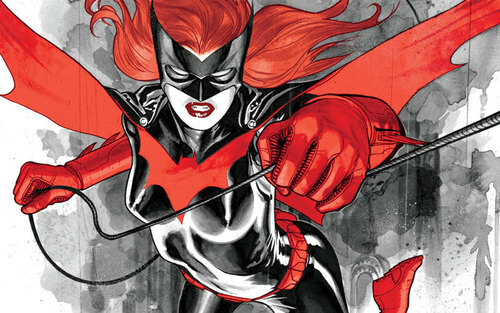 Mask or not, a cut in the costume that reveals a tattoo could possibly link Batwoman to Kate. You don't go around beating up criminals as a hobby without earning a few enemies. While the cape and cowl are a pretty strong deterrent, there are plenty of people out there who would love to mount Batwoman's head on their wall. Kate's war on crime is the absolute strongest driving force in her life. It pushes her physical and emotional limits, and often causes problems with her personal life. It's hard enough for a girl to keep a girlfriend as it is, and moonlighting as a vigilante doesn't help. When Kate falls for someone, she falls hard. She is subject to jealousy, bad judgement, and even takes unhealthy risks in costume. 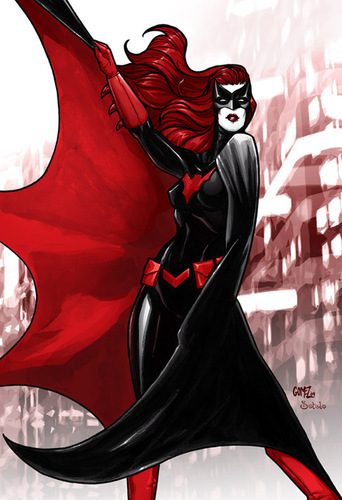 Kate Kane is the step-daughter of Catherine Hamilton, a Gotham weapons mogul. It's a bit less well-known that her father is retired Colonel Jacob Kane. Kate is well-known in the Gotham socialite scene as a party-girl. Notoriously so. She likes late nights, plenty of liquor, fast cars, and fast women. Yes, she's THAT kind of party girl. And doesn't care who knows. In Gotham's darkest, most dangerous neighborhoods the legent of The Batman has kept criminals looking nervously over their shoulders for years. Now, however, the GCPD has been finding more and more incidents of criminals zip-tied to lamp posts, bloodied and battered and with occasional broken bones. 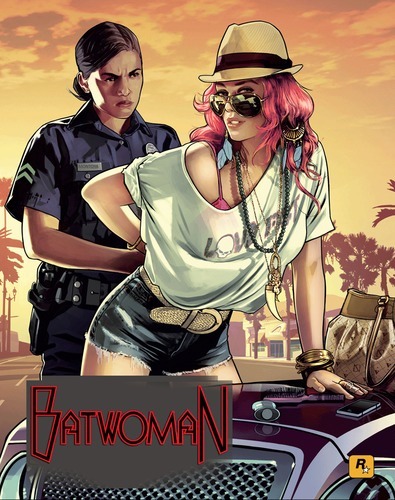 And when they mutter about a 'Batwoman', the police just laugh it off.